and Forestry and Sammy Noel. Change is inevitable in life, and so it is with the Louisiana Rice Research Board. Gov. John Bel Edwards appointed eight new members to the 15-member board, which consists of 14 producer members and the commissioner of agriculture or his designee. With that change, board members with a considerable amount of institutional knowledge are no longer serving, but their leadership and service is not lost. Each has offered continued support and insight through these challenging and uncertain times facing our rice industry. I would be remiss if I did not express appreciation to former chairman Jackie Loewer and the other retired board members for their years of sacrifice, dedication and unselfish service to the Louisiana rice industry. They have left the footprints for us to follow as we move our industry forward. There is a determination and pride with the new board, which was definitely evident as we held our first meeting and began addressing industry issues. 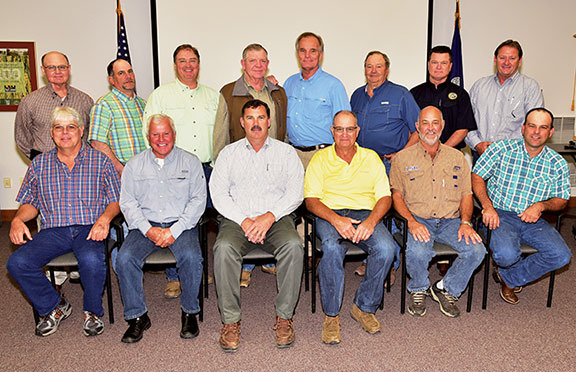 The board is made up of producers from around the state representing all rice growing regions and various representative rice groups throughout the state. The board is charged with expending funds collected and entering into contracts with research organizations and agencies related to the production, handling, marketing or utilization of rice for the purposes of research. This is a tremendous fiduciary responsibility that this board does not take lightly, Board members are determined to enhance our rice industry. The board meets each fall to review and discuss the various ongoing research projects and new proposals to determine the appropriate funding available. It is no small task and typically takes a full day of presentations from scientists, followed by a board discussion to allocate the available funds. The board has limited funding available from checkoff assessments and the Colombian and European tariff-rate quota (TRQ) allocations. The board cannot spend more money than it receives from either checkoff or any of the TRQ sources. In response to significantly lower income for this funding cycle, the board decided at its November budget meeting to fund a large majority of the continuing projects at a reduced level and to support only four new projects for the coming year. Many worthy projects were considered, but in the end the board had no choice but to live within its means. This was a good year for checkoff receipts as we had an increase of approximately $238,000 over what was projected last year. The increase in the size of the Louisiana rice crop strengthened the checkoff funding for projects this year. This is the core funding for research projects. This year, Louisiana rice producers will be reinvesting $1.5 million of their checkoff dollars back into rice development to benefit our industry for the generations to come. Unfortunately, the board faced an unexpected $890,000 shortfall the previous year from the Colombian Free Trade Agreement (TRQ funds). These funds have historically been used for both research projects and capital improvements at the H. Rouse Caffey Rice Research Station. Because of the decrease in the certificate values of rice sold to Colombia, our revenue has decreased significantly. The board also reaffirmed the prior commitment of $1 million from previous budgets to fund an endowed chair to provide endless years of support for rice research at the H. Rouse Caffey Station. The new board members not only supported this effort, they also agreed to contribute an additional $500,000 of this year’s TRQ funds to strengthen the chair. The interest from the endowment will be used to support the work of the talented researchers at the station in perpetuity. A new state-of-the-art milling lab that will be ready for the 2019 rice crop has also been made possible with these TRQ funds. This will help develop sustainable superior rice varieties that are acceptable to our end users, and it is just one of the many capital improvements the board has supported. This year a spray rig was added, and greenhouse renovations were approved through TRQ funding totaling $305,000. The Colombian Free Trade Agreement (TRQ funding) that has generated these funds has been a windfall for rice research, and the board has made sure that this money — as well as your checkoff dollars — has been put to good use. In times of state budgetary restrictions, the Colombian funds have made it possible to make these improvements at the station to continue its prestigious position as the most outstanding rice research facility in the nation. Our rice industry is not without challenges like those faced by other industries in the state. Fortunately, we have the rice checkoff program, which allows us to reinvest in our future each year to protect and expand our efforts so generations coming behind us will have a vibrant industry. The year 2018 has seen many changes. Your Rice Research Board recognizes these changes and is committed to strengthening our efforts to enhance a program that will be here for generations to come.